An ideal accessory for your tent as it provides a warm and comfortable surface underfoot. It is also ideal for children to play on. The top surface is a soft but durable fleece that has an insulating foam middle layer and a waterproof backing. 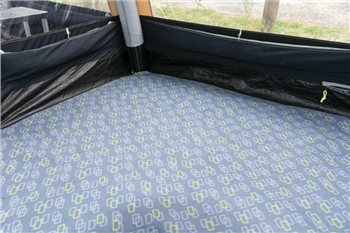 Carpets are available to fit the living areas of most of our tents. Quality was just what I wanted but actual size was not clear from the description on line. Had to order larger aize and return this item. The returns department somehow managed to mislay the return paperwork included with the carpet and ignore the "sender " label on the outer wrapping. However Aimee in the Sales Department sorted this all out very promptly once I advised of the non arrival of the refund. I now have my refund and a carpet that fits!